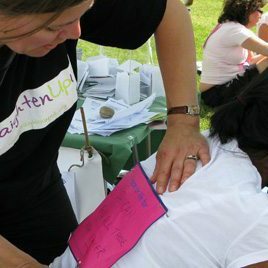 Tone has been an active British Chiropractic Association member for many years promoting the profession through her various projects. Together with her daughter, Tone has been encouraging chiropractors from around the world to take part in ChiroGlobal and tell us why they love being a chiropractor! Tone was awarded Chiropractors Chiropractor for 2018 after being nominated by and voted for by the BCA membership for her commitment to the development of this profession. The traffic light system & MOT approach were very helpful in the past. I am now finding the Maintenance System to keep being in the ‘green’ & prevent a slide back very beneficial! treatment sessions I have received have been beneficial to my well-being and health. Thank you. Great practice. Well done all! For me, Tone is simply the best. What more can you ask for! Very friendly professional therapists who have successfully resolved my issues with lots of encouragement- thank you! Nothing I think you can improve, the whole team are always very helpful and the treatment is the best! I love my appointments at Lucks Yard it’s like going to see friends but with the right amount of professionalism. My wellbeing has improved enormously. I cannot at present think of any suggestions which might help you to improve further from your already very high standard of professional and friendly care. But if I do, I will certainly let you know! It’s good to come along and have a session as a body MOT!! once in a while without having any major problems or niggles. I have been treated by Nic seven times now and it has made a big difference to my wellbeing. I have less back and leg pain, my posture awareness has increased and I feel better allround. Thank you so much! Lucks Yard is a positive experience with a feeling of confidence….feel better just for coming!! I’ve had a repeating back pain for 20yrs+ which caused other problems over the years. I have had a few visits, I’m pleased to say the pain is not as intense & working live is not as painful. So yes I would recommend Luck’s Yard. Always a pleasure to come to Luck’s Yard and the children always love their sessions with Tone! Really I can’t think of anything that could be better. I am completely satisfied, both with the treatment and advice given. Clone Tone so that there are several of her in the practice. She’s great! Always get a satisfactory result. No problems, frees all the stuff bits and gets me going again. Everyone is very friendly. Keep up the good work. Tone is amazing with the knowledge of her body and she has really helped my son and husband – she is amazing !! The massages were wonderful, he has a very strong hand which I liked very much and didn’t talk too much- I like silence! Brilliant team of therapists, our whole family uses Lucks yard. Rather than go to the GP we go to Lucks Yard! Very, very good treatment , that good that I don’t need any more for a while. Immediately I have any more trouble with my back , I’ll be back immediately Thanks. Love coming to see you. Keeps me from seizing up! Thank you! Tone & Rob have kept the entire family on track for 7 years. We all wish we could see them more, and they’ve given us huge knowledge on how to lead healthier and stronger lives thus far. They have taken away a lot of pain and got us all fitter and more upright! With each visit I learn something new and relevant about my body and how I treat it. I have to say Lucks Yard’s main interest has always been keeping patients healthy, rather than a business selling treatments. Truly remarkable! Rob was absolutely fantastic. So much so that I have booked another massage. There’s no ‘luck’ in the ‘yard’, it’s just professional!We are very happy with all treatment both my husband and I have received at Luck’s yard over the past couple of years.